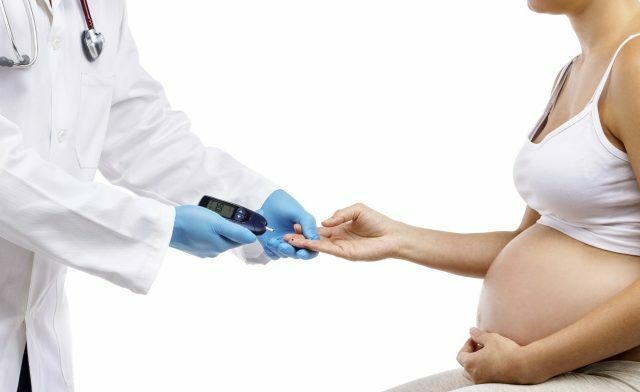 (HealthDay News) — A higher-complex carbohydrate/lower-fat (CHOICE) diet significantly improves gestational diabetes-associated markers compared with the conventionally recommended low-carbohydrate/higher-fat (LC/CONV) diet, according to a small study published in Diabetes Care. Teri L. Hernandez, PhD, RN, from the University of Colorado in Aurora, and colleagues randomly assigned 12 diet-controlled overweight/obese women with gestational diabetes (at 31 weeks) to an isocaloric LC/CONV (40% carbohydrate/45% fat/15% protein; six participants) or CHOICE (60%/25%/15%, respectively; six participants) diet. All meals were provided. Adipose tissue was assessed via biopsy at 37 weeks. After approximately 7 weeks, fasting glucose (P=.03) and free fatty acids (P=.06) decreased on CHOICE, whereas fasting glucose increased on LC/CONV (P=.03). On the CHOICE diet, insulin suppression of adipose tissue lipolysis was improved, compared with LC/CONV (56% vs. 31%; P=.005), consistent with improved insulin resistance, the researchers found. Adipose tissue expression of multiple proinflammatory genes was lower (P<.01) on the CHOICE diet, compared with LC/CONV. With CHOICE, infant adiposity trended lower also. “A CHOICE diet may improve maternal [insulin resistance] and infant adiposity, challenging recommendations for a LC/CONV diet,” the researcher wrote. Hernandez TL et al. Diabetes Care. 2015;doi:10.2337/dc15-0515.